Many would say we live in turbulent times marked by upheavals in many parts of the world. There is certainly a lot of confusion and misconception regarding the role of religion – especially Islam. During last year’s IB Global Conference in Toronto, an all-day pre-conference session on ‘Many Muslim Voices’ addressed some of these issues head on. We’re glad to share some of that work more widely, in this three-video series. 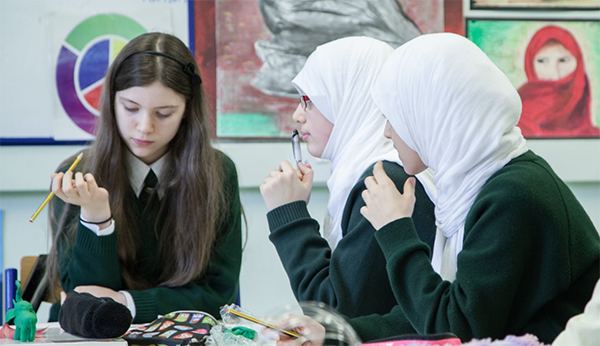 They offer ‘food for thought’, frameworks for inquiry, and a resource for schools to use in their own journeys towards intercultural understanding. They cast light on underlying assumptions, clarify some misconceptions, and create real opportunities to understand other people and their differences. The first video features Diane L Moore, the director of the Religious Literacy Project and a Senior Scholar at the Centre for the Study of World Religions at Harvard University. Her presentation focuses on understanding religion through the lens of critical theory. After highlighting some common religious illiteracies, she shares tools to use for teaching about religion in contemporary settings. The second video provides the synopsis of an interactive workshop by Jovanna Scorsone, Education Manager at the Aga Khan Museum in Toronto, along with Alex Holland, Curriculum Development Manager for the Aga Khan Academies. This video introduces objective-based learning through inquiry into the idea that every object has more than one possible story. It inspires students to think and wonder and connect material culture with both ancient and contemporary stories. Using artifacts from the museum gallery, the workshop demonstrated the value of student engagement with hands-on learning – especially when the learning process is aimed at developing the capacity to connect cultures in a greater global context. The video shares tips for engaging students with works of art (asking open-ended questions, layering information, making connections between information and ideas, and reflecting on personal experience). In the third video, Naheed Bardai, Head of Middle Division at Upper Canada College, summarizes his presentation on the difference between pluralism and multiculturalism. It offers, from the perspective of an IB World School, examples of teachers and school leaders who embrace diversity and empower members of the school community to express their identities within a framework of shared belonging. The presentation focuses on the power of debatable questions—as part of the Middle Years Programme (MYP) unit planning process—to address pluralism systematically during everyday classroom interaction. Naheed presents a case study of Islamophobia that engages educators in a thought-provoking discussion of power and privilege. We’re very grateful to the presenters, the Aga Khan Development Network, Dhahran Ahliyya Schools, and The Advanced Learning School for their contribution to the event. If you use these videos for your own professional learning, teacher professional development in your school, or in an IB workshop, please let us know! Your feedback is always welcome. Sumaya Alyusuf is a curriculum manager at the IB Global Centre in The Hague, Netherlands.